Regional fund management firm NEL Fund Managers has given its official backing to supporting ex-service personnel as they move into civilian life and new commercial roles. 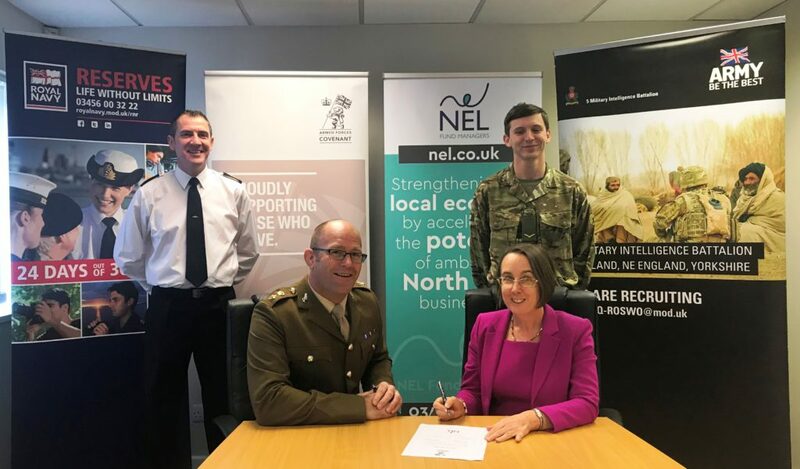 Having invested in a number of businesses set up and run by former military personnel, NEL has now become a signatory to the Armed Forces Covenant as a way of encouraging more entrepreneurs with a services background to put their business plans forward for consideration for investment. The Covenant acknowledges that those who serve or who have served in the armed forces, and their families, should be treated with fairness and respect in the communities, economy and society they serve with their lives. Businesses, charitable, and public sector organisations of all sizes who wish to support the armed forces community can sign the document and are free to make their own specifications on how this support will be expressed through their operations. Companies run by ex-service personnel in which NEL has invested in the past include Hebburn-based asbestos management firm Nichol Associates, communications business Callstream and software company Platform One. Dr Yvonne Gale, chief executive at NEL Fund Managers, says: “The Armed Forces produce highly motivated, disciplined and hard-working individuals, and gives them the chance to develop a range of skills, experience and expertise that are wholly transferable into civilian life. “These are all attributes that they share with successful entrepreneurs and we’ve worked with many former military personnel who have gone on to achieve great success in their subsequent business careers. David Eccles, MOD Assistant Regional Employer Engagement Director said: “Employers can reap real rewards from employing military personnel such as Reservists and Service Leavers, acquiring a portfolio of skills and behaviours that are beneficial in a modern working environment. NEL Fund Managers is responsible for managing two of the five funds that make up the £120m North East Fund Supported By The European Regional Development Fund. The £9m North East Small Loan Fund typically offers loans to businesses of between £10,000 and £50,000, while the £18m North East Growth Capital Fund offers unsecured investments of up to £500,000 to established businesses looking to realise their growth potential.